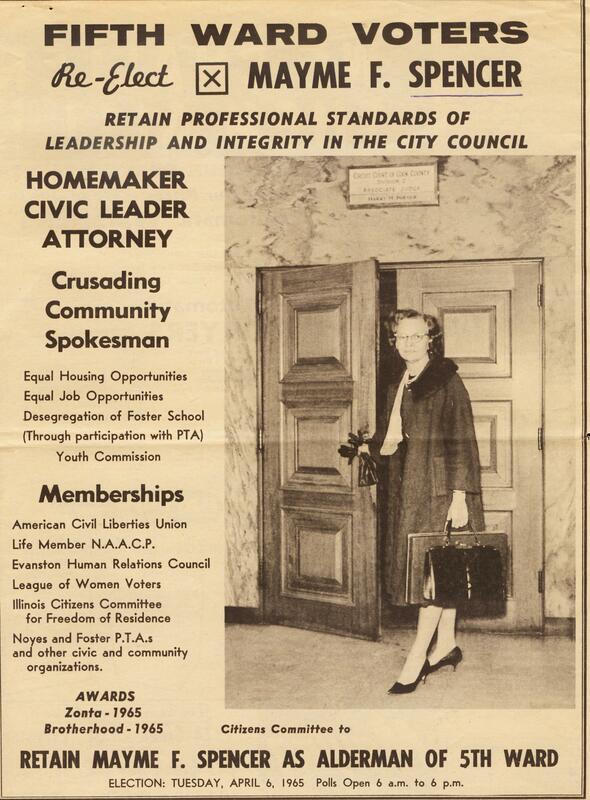 Attorney Mayme Finley Spencer was Evanston’s first African-American female alderman. She came to Evanston in 1957 with her husband Warren, a doctor at the Community Hospital. Spencer was elected alderman in 1963 and served two terms. A graduate of Kent College of Law, Spencer practiced law for many years at a Chicago law firm while also raising four children and serving on numerous city commissions and the city council. 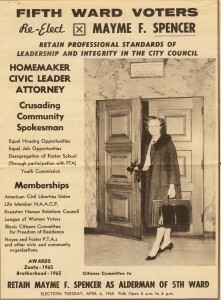 She was also active in the local civil rights movement, especially in the movement for fair housing, and at Mt Zion Missionary Baptist Church. Mayme Spencer died at the age of 89 in February 2011. Here is a link to her Chicago Tribune obituary — http://www.chicagotribune.com/features/obituaries/ct-met-spencer-obit-20110208,0,4661222.story.